essential piece of equipment for a progressive sheep farmer in Australia. Many happy customers are using portable sheep yards to handle their flocks especially when it comes to lamb marking time. 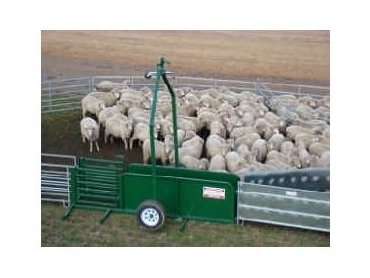 The portable sheep yards which are quick and easy to set up have a drawbar assembly which once raised to a vertical position give the operators easy access to the sheep as well as being completely safe for the animals. Carrying up to 35 panels, the single axle drafting module should hold 1300 head. The tandem axle trailer module can carry up to 80 panels and hold up to 2500 head.